When I began listening to Between the lives I honestly wasn't sure what to expect. I knew the story was set in Massachusetts and that the main character Sabine alternates between lives every 24 hours but beyond that I had never heard much about the book. If you've ever lived in or visited New England you know that the accents are quite unique to the area. This becomes especially true once you hit Boston. I mention this because Boston is where Sabine lives part of the time so naturally I expected a lot of slang unique to the area to be incorporated into the character. Unfortunately due to the Narrators Australian accent I really couldn't place where Sabine lived. In all honesty if it was never mentioned where the character lived I'd have thought the book was set in Australia or at the very least another country. Thankfully, Sabine's lack of accent quickly became unimportant as I fell in love with her character, the story and her respective families. One of the things I really loved about Between the Lives was the fact it didn't really make it an issue to explore why Sabine is able to travel between her lives. I kept waiting for some Government agency to swoop in and hunt her down but the book went in a completely different direction. In one life the world goes on. Sabine attends parties, dates, does homework, and deals with friend and family drama. In her other Life Sabine's secret has been exposed but instead of those in the know taking Sabine seriously she is committed to an asylum instead. Now to talk about Sabine's lives individually would give way to much of the story away. So instead I want to talk about things I particularly found interesting. The characters- As stated above I loved Sabine. She was feisty, smart and had a good disposition considering the circumstances. I also found her inner strength to be her greatest attribute. It has to be hard living completely separate lives while still retaining knowledge from both worlds. I also loved Ethan he was charming, sweet and kept Sabine on her toes. Sure it was quite obvious that Ethan and Sabine would get together but I enjoyed the pairing nonetheless. Ethan has a pretty big twist towards the end of the story that knocked the wind straight out of me. Did not see that coming at all. Of course to find out what exactly that is you will have to read the book yourself. No spoilers here! Switching Lives- While Sabine can't bring anything material like notes, clothing, jewelry as she jumps between lives it does seem that little changes to her person such as dying her hair, breaking her arm, getting sick will be affected at least somewhat. The Asylum- Such a nice plot twist. Sure her Asylum life wasn't nearly as exciting as the life where she was still attending parties and school but it created an interesting place for Sabine to return to and after years carefully controlling her actions it was nice seeing that vulnerable side to her character where she had little to no control over her daily existence. The Romance- I usually don't like much Romance in my stories but I couldn't help but enjoy Ethan and Sabine together. Yeah it was obvious they would get together but Between the Lives reaffirmed my belief that true love knows no bounds. Really, well done. Overall, I loved Between the Lives and it is a book I no doubt will listen to again in the future. Would I recommend it though? Oh yes!! The writing was flawless, the pacing perfect and the characters complicated! With that being said, I will be rating Between The Lives by Jessica Shirvington ★★★★. 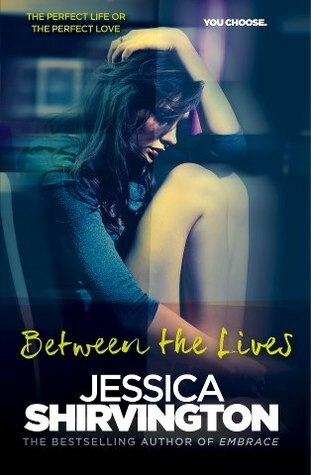 Want to learn more about Between The Lives or the Author? Click on the links below!